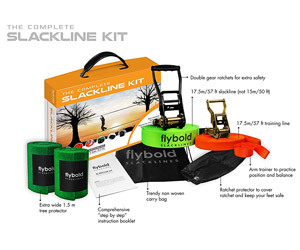 The Flybold is a quality slackline kit, perfect for beginners or kids thanks to the included teaching line and arm trainer. It’s very easy to use, sturdy and not expensive. 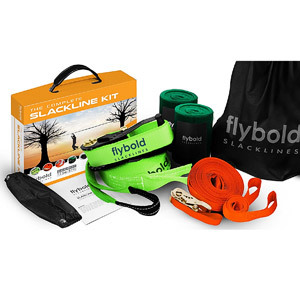 Flybold is another classical 2″ wide slackline kit – using ratchet as a joining mechanism makes it super easy to set up or take down afterwards, it would take only about 10 minutes. A nice bonus are the included tree pads to protect both your line and the trees from damage. It works great, only they could have been a bit longer – at this length they’re not ideal for larger trees. The ratchets are good quality, you can set the line really tight and the entire system becomes very solid and sturdy. According to the manufacturer, the weight limit is 300 lbs. And there is also a little pouch to cover the ratchet and protect your feet – but keep in mind you still don’t want to step on it, even when covered! 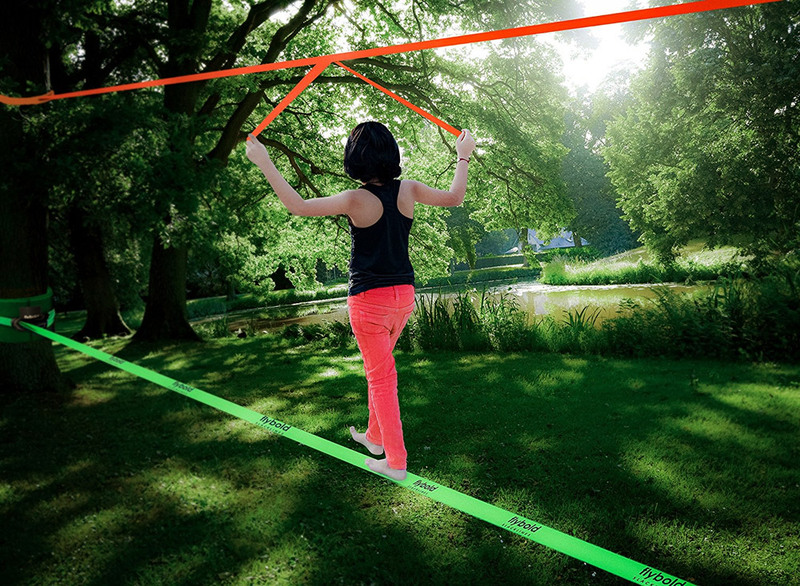 The Flybold is an entry level slackline, perfect for beginners or kids thanks to the included teaching line. You simply set it up above the main line and use it as a support before you develop the right balance skills. 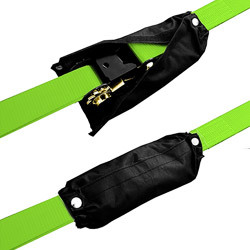 There is also a little strap (called an arm trainer) to help you develop the correct arm position and upright stance – very helpful. For children you would probably want to start with a loop tied around the teaching line (so it doesn’t fall down all the time) and release it after some time. 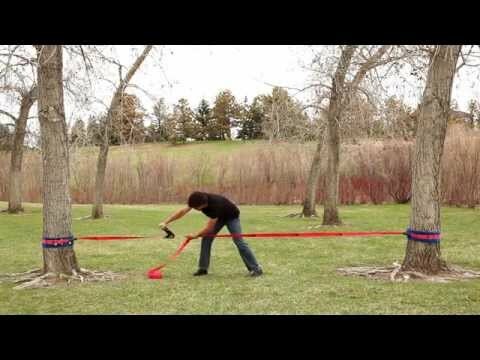 It offers a length of 57 feet which is a nice bonus over 50 ft slacklines – however, the length is not measured using the TrueLength concept, so you still get only a 50 ft of walkable line plus 8 ft of the ratchet part. 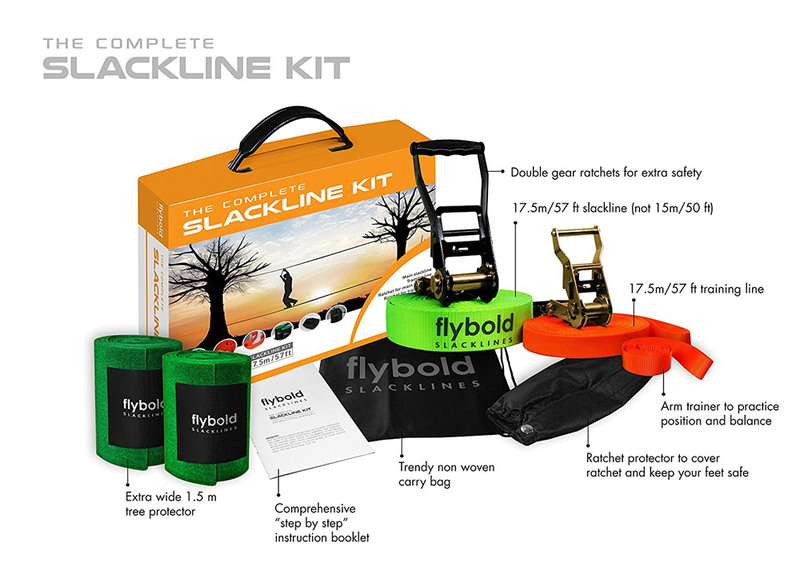 Unfortunately, Flybold does not offer a longer version of this product which limits its use for advanced slackliners who would enjoy longer walks. The Baseline from Sl. Industries is certainly more versatile in this regard (but does not offer the teaching line). 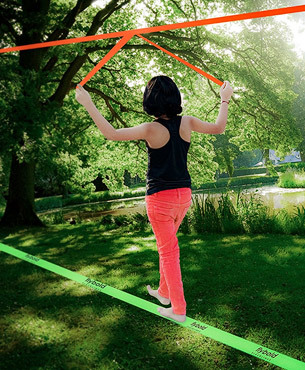 Slackline is a perfect gift for almost anyone – all generation can have fun with it, kids love it and it can be used as a great workout as well. It presents an entertaining way to develop your core strength, improve balance and coordination. It’s a perfect tool for birthday parties, obstacle courses or just a little garden fun. You can even set it up over a pool! And thanks to its compact size (and the included carrying bag) you can take it anywhere with you – on trips, camping, into parks and so on. 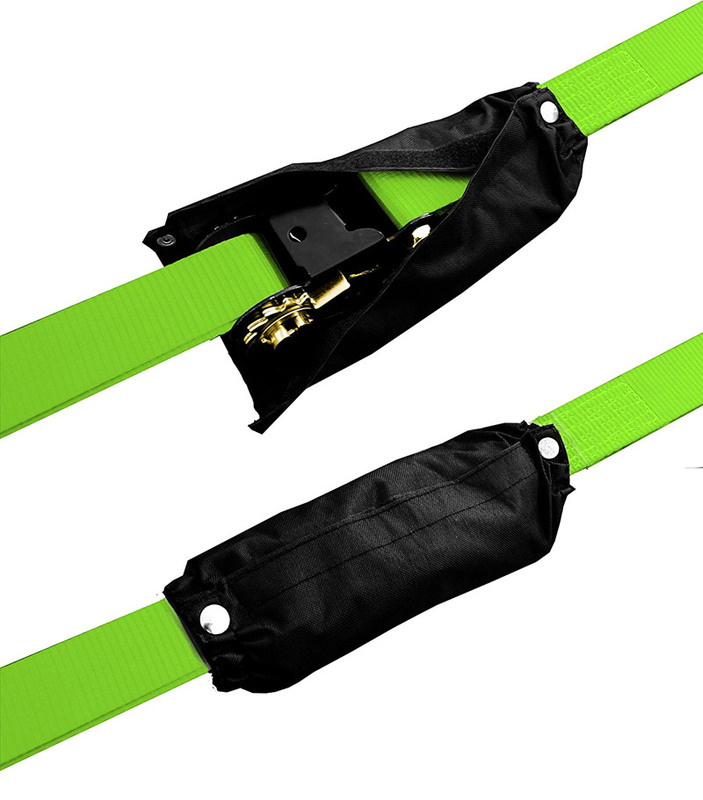 Conclusion: The Flybold is an excellent choice for beginners or kids – sturdy, safe, with included teaching line and tree protection and for a good price. We can definitely recommend it. However, if you would like to try some longer walks later, we would rather recommend you the longer (85 ft) version of the Baseline. And which one for tricks?